Factor your clients' religious beliefs into their therapy! A recent Gallup poll found that nearly two-thirds of Americans surveyed said they would prefer to receive counseling from a therapist who is religious. The Power of Spirituality in Therapy: Integrating Spiritual and Religious Beliefs in Mental Health Practice addresses the apprehensions many clinicians have when it comes to discussing God with their clients. Authors Peter A. Kahle and John M. Robbins draw from their acclaimed workshops on the integration of spirituality and psychotherapy to teach therapists how they can help clients make positive life changes that are consistent with their values and spiritual and/or religious orientations. The Power of Spirituality in Therapy combines psychotherapy, spirituality, and humor to examine the “pink elephants” of academia-Godphobia and institutional a-spiritualism. The book explores the “learned avoidance” that has historically limited therapists in their ability—and willingness—to engage clients in “God-talk” and presents clinicians with methods they can use to incorporate spirituality into psychotherapy. Topics such as truth, belief, postmodernism, open-mindedness, and all-inclusiveness are examined through empirical findings, practical steps and cognitive processes, and clinical stories. To Be (Ethical) or Not to Be? WHAT is the Question? To Believe or Not to Believe? That is NOT the Question! In God Do Therapists Trust? 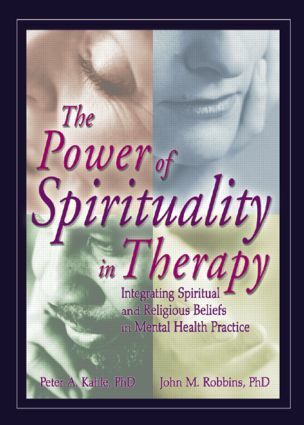 The Power of Spirituality in Therapy is an essential resource for therapists, counselors, mental health practitioners, pastoral counselors, and social work professionals who deal with clients who require therapy that reflects the importance of God in their lives. This guide will help those brave enough to explore how their own spiritual beliefs and/or biases can create problems when working with those clients. Can We Agree That Many Have Disagreed? In God Do Therapists Trust? In Reality, Better Training Is a Must! Section II: How then Shall We Counsel?